George Jonathan Sargent was born in Brockham, Surrey on 2 August 1882 (GRO Reference: Jun 1882 Reigate 2a 176), the second eldest son to William Henry and Amelia Jane Sargent (nee Hackett). George's parents were married in 1880 (GRO Reference: June 1880 Reigate 2a 201) in the Reigate registration district. After their marriage, the 1881 census enumerator recorded that William and Amelia were living at St Martin's Place, Dorking, Surrey. William was aged 25 and worked as a Maltster in the brewing industry to support his 19-year-old wife who was expecting their first child, Alfred Henry. George was born the following year and their sister, Rose Edith, in 1886. The family moved to Epsom soon after Rose's birth. "The first recollections I have are of playing up and down the road, with a stick, with a knob or crook at the end, and trying to drive along a round pebble, in imitation of the golfers." George soon began to frequent Epsom Downs Golf Club and before long became a caddie there. The golf course flanks the famous Epsom Downs horseracing course and on a clear day, because it's on high ground, has wonderful views across London. When the 1891 census was taken the Sargent family's address was given as 10 Carter's Cottages in Upper Downs Road, Epsom, just down the road from the golf club. George's father was still working as a Maltster to support his family. Three years later another son was born. William John was baptised in Epsom's parish church, St. Martins of Tours, on 25 March 1894. Later that year, before his twelfth birthday, George started a six year golf club maker apprenticeship with Thomas McWatt, professional golfer of the Epsom Downs Golf Club. Photograph of signed photograph of George Sargent, 2012 [original date unknown]. George had spent three years learning the art of making golf clubs before coming to the notice of golfer Harry Vardon, another famous professional golfer. Both Vardon and McWatt obviously saw great potential in George as a golfer and urged him to practice as often as he could, so by the time he had reached the age of sixteen, George was able to say: "I could hold my own with a scratch man". This meant a very good golfer. Aged 17, George spent 1899 under the guidance of Harry Vardon at the Ganton Golf Club in Yorkshire. Here, not only did he learn to teach and play a better game of golf but, like many golfers of this era, also learnt to manage golf courses and design new ones. George went on to be coached by Sir Edgar Vincent in Esher, Surrey, as a private professional golfer. It was while he was there that he played his first game in a championship in Muirfield Scotland. George reminisced in 1909 that he was drawn against Willie Park, and after the first round, was in fifth place. As he was so young, it created a big sensation and all sorts of brilliant futures were prophesied for him. Harry Vardon even remarked that everyone was going round, asking who the blazes Sargent was! George moved on as a professional player to the Dewsbury Golf Club in Yorkshire where, during the next four years, he won one or two prizes in open tournaments. In 1900 George competed at St. Andrews in Fife, Scotland, in one of the world's major golfing tournaments 'The Open Championship', where he finished fourth after John Henry Taylor. George was at home with his family on the night of 31 March 1901, when the census for England was taken. It records that the whole family with the exception of George's sister Rose, who was working as a servant for the Downton family in Upper Norwood in Surrey, were living in 11, Matilda Cottage in Miles Road, Epsom, Surrey. These cottages were built in 1899 and are still occupied today . George's father had left the brewing trade and was by then labouring in a brickyard, where his older brother Alfred also worked. His younger brother William was aged 7 and at school. Eighteen-year-old George was described as a 'Golf Professional'. George's mother Amelia was expecting again when this census was taken and the birth of Arthur Charles Sargent was recorded in the June quarter of 1901. Arthur only lived for 4 months. Epsom Cemetery records that his burial in plot D42, took place on 19 September 1901 and that he was the son of William Henry Sargent of Miles Road, Epsom. In the middle of 1905, just a couple of months before the birth of George's brother Frederick on 20 July, George's unmarried sister Rose became pregnant. Soon afterwards, having also felt that there was not much chance of developing his game further in the UK, George left the Dewsbury Golf Club and travelled to the Royal Ottawa Golf Club in Gatineau, Quebec, Canada. However, he recalled in 1909 that he had little or no encouragement in the three years he was there as a player. His sister Rose was later admitted into the Epsom Union Workhouse for 10 days on 19 January 1906, and was readmitted on 13 February for the birth of her daughter Grace on 24 April. Mother and baby were discharged a month later on 23 May 1906.
and of her Leaving England in July 1907. The couple went on to have ten surviving children. Wedding Photograph of George and Beatrice Sargent, 1907. It would appear that Beatrice travelled alone on S.S.Victorian to join him in Ottawa on 14 July 1907. That same year, George became the golf professional serving the new golf course that he had help design and lay out, at the Hyde Manor Hotel in Sudbury, Vermont, New England, USA. On 7 February 1908, in Hull, Quebec, Canada, Beatrice gave birth to their first son Alfred William George. Also that year George competed in the Canadian Championship and was runner-up with a score of 304, four strokes behind the winner, Albert Murray. The New York Times wrote: "His play was both brilliant and consistent from the start to the finish." The following year on 6 March 1909, leaving his wife Beatrice at home at 11, Truro Road, Wavertree, Liverpool, George sailed from Liverpool on the S.S. Mauritania to New York and on to the Englewood Golf Club in New Jersey where he won the 1909 United States Open Championships. His prize that day was $300 [2012 value = $7,500.00]. "The Open event which was held on the links of the San Francisco Golf and Country Club at Ingleside, Oct. 20th-23rd, was marked by the presence of a number of the leading Western and Eastern players-Willie Anderson, Fred McLeod, Geo. Sargent and H. H. Barker. In the qualifying round Sargent won with 72, 75-147, receiving a special purse of $100." Photograph taken at Presidio Golf Club during the Portola Golf Tournament in San Francisco. After this win, George served for 7 years as the head professional at the Congressional Golf Club in the Chevy Chase Country Club in Maryland, north of Washington D.C. When the USA 1910 census was taken, George stated that he was a 'Golf Champion'. George and Beatrice were by then living at Bethesda, Montgomery, Maryland (north of Washington DC), along with their one year old son Alfred W.G. who had been born in Canada and an un-named one month old daughter who had been born in Maryland. This daughter may have been Nina Millicent who appears on the next census. Boarding with the family were Tom McWatt's son Robert and daughter-in-law Davina. 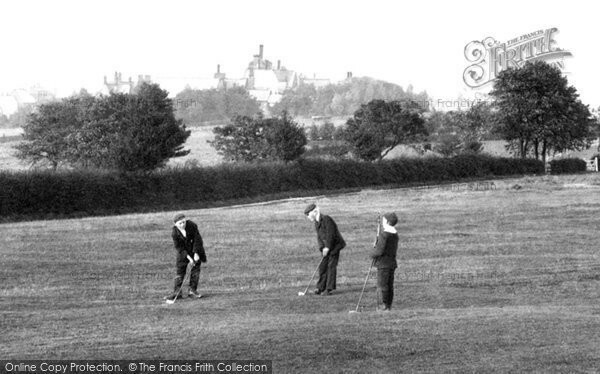 Robert had also been coached in the game of golf and golf club making by his father when they lived in Epsom. Back in Epsom in 1911, George's family were now living at 19, Beaconsfield Cottages, Epsom. George's 56-year-old father was still labouring in the brickworks, as was his younger seventeen-year-old brother William. George's 49-year-old mother and brother Alfred were not recorded on this census return, but his father stated that he had been married 31 years, had had six children and that five were still alive. Also at the address was George's five-year-old "cousin" Grace Sargent. Under her name, recorded as another son, was 4-month-old Arther Sargent. Therefore, this would mean he was born in December 1910; the only birth registration that has been found for a boy of this name, spelt either as Arther or Arthur, was in Gloucestershire. If he was the son of William and Amelia, then the total number of children born to them should have been recorded as seven. Whether he was a very late addition for his 49-year-old mother Amelia or a child taken in by the Sargent family is not known. In 1912 George won the Canadian Open on the course at Rosedale Golf Club in Toronto. When war was declared in Europe, George's older brother Alfred attested in Epsom, on 13 October 1914, to 'do his bit for King and Country' and served in the 8th Battalion Devonshire Regiment. Less than a year later on 25 September 1915, Alfred was killed in action. A month after Alfred's death, their younger brother William enlisted into the army. Their story can be read on our WW1 memorials page. By 1917 George was serving as the Head Golfing Professional at the Minneapolis' Interlachen Golf Club, a nine-hole golf course club in Minnesota. It was also during that year, on 10 April, that George became one of the original members of the Professional Golfers' Association (PGA) of America. In 1918 the US government required World War I Draft Registration Cards to be filled in. George gave his address as 5036 Vincent Ave., South Minneapolis, Minnesota and his occupation as a Golf Instructor working for the Interlachen Country Club in Minneapolis. In 1919 George Sargent succeeded Arthur Smith, another player from England, as the second professional at Scioto Country Club. George and Beatrice appear still living at this address on the US 1920 census along with their seven children Alfred William George (2 July 1908 - 21 January 1947), Nina Millicent (1 April 1910 - 23 November 1989), Marguerite Mary (23 September 1911 - 9 February 1963), Gladys Nora (25 September 1912 - 9 August 2004), Harold Lester (16 October 1913 - 3 March 1990), Donald Bertram (21 October 1914 - 5 January 1998) and Evelyn Lucy (23 December 1915 - 18 November 1992). All of them, with the exception of Alfred who had been born in Canada, were born in Bethesda, Montgomery, Maryland. This census also states that George, Beatrice and Alfred had immigrated to the United States in 1909. Soon after this census was taken, George and his family moved to 1520 Wyandotte Road, South Minneapolis, Minnesota. In 1921 George became the 3rd PGA President and served for five consecutive years. George was also approached that year by the newly established Athens Country Club in Ohio to provide plans for a new golf course layout for them. Apparently, so keen were the members to play, that a temporary six-hole course was constructed to allow them to begin playing immediately while George prepared the plans for a nine-hole layout. This course was used from May 1922 until 1928 when it was redesigned. The family moved again in 1925 to 1346 Lincoln Road in Columbus, Ohio. The following year turned out to be extremely busy for George who was not only instrumental in capturing the 1926 U. S. Open for the Scioto Country Club in Columbus, but was also commissioned to draw up plans for the town's new 9-hole golf course, which became known as the York Golf Club. George supervised the construction of this course, which was opened for play in 1927 with the clubhouse opening in 1928. In between all of this, George became a broadcaster and somehow managed to give golf lessons on the radio! George also had the inspirational idea to use footage from motion pictures to study the style and actions of golf swings. Using this footage he was able to point out good and bad techniques. The US 1930 census was taken on the 1 April. In addition to their seven previous children, three more were listed: George Thomas (14 March 1922-6 June 1963), Jack Douglas (26 April 1924-8 January 1985) and Beatrice Ruth "Tootie" (21 October 1925-19 April 2009). These children had all been born in Columbus, Ohio. George's eldest son Alfred was working as a professional golfer's assistant, while daughter Nina was working as a librarian and daughter Marguerite in a doctor's surgery. Alfred, Harold and Jack all went on to become accomplished golfers. George and his wife Beatrice visited England, arriving on 12 August 1930, to stay with his parents in Epsom. Having left their younger children in the care of their older siblings, the couple stayed for less than a month and sailed back aboard the S.S. Aurania to the port of Detroit, Michigan arriving on 9 September 1930 before heading off to their home at 1346, Lincoln Road. George was described on the arriving Detroit Shipping Manifest as being 5'10" tall, grey haired, brown eyed with a fresh complexion. This was maybe the last time that George saw his father alive. William was aged 77 and died whilst living at his home 19, Beaconsfield Place, Church Road, Epsom. He was buried on 10 August 1932 in plot K484 in Epsom cemetery. It was also this year that George, following repeated requests since 1926 from pro-golfer Bobby Jones, moved once again to serve as Head Golf Professional, at the East Lake Country Club in Atlanta, Georgia. George's 78 year old mother Amelia Jane, of 19, Beaconsfield Place, Church Road, Epsom, died on 25 February 1940 at 2, Horsham Road, Dorking and was buried on 28 February in plot K484 with her late husband in Epsom cemetery. Probate was granted to her son William John Sargent and her granddaughter Grace Tweed, nee Sargent, who had married Charles Edward Tweed in 1929 in Epsom. Six years after the death of George's mother, on 20 February 1946 in Atlanta, George and Beatrice became U.S.A. citizens. Almost a year later, on 21 January 1947, their eldest son Alfred died in Toledo, Ohio. George served for fifteen years at the East Lake Country Club until his retirement in 1947. He died two months before his 80th birthday on 6 June 1962. His wife Beatrice died six years later on 8 May 1968. They had 21 grandchildren who remember their Pop and Nana with love and affection. It was not until 7 January 2005 that George was posthumously inducted into the PGA Golf Professional Hall of Fame. Carol D. Hitchcock, Granddaughter of George J. Sargent. Heather Tweed, Great, great, great niece of George J. Sargent.